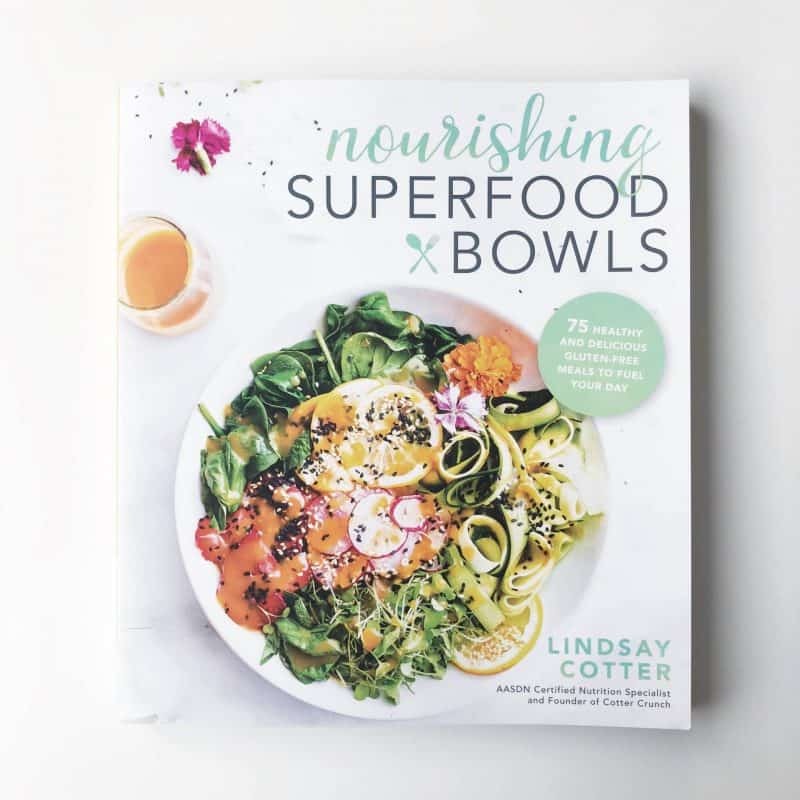 I’ve got a special recipe for you today from my friend Lindsay who recently released a BEAUTIFUL cookbook called Nourishing Superfood Bowls. I’ve followed Lindsay’s blog, Cotter Crunch, for several years and was finally able to meet her last year at the Everything Food Conference. I’m a huge fan of her photography and her food, so I’m really proud of her for putting together this compilation of breakfast, lunch, family-style, plant-based, and dessert bowls. Even though it may seem like recipe posts are easier to write than my 1000-word reflections on my brain and society (ha), they’re actually really hard for me to write. Do I only talk about the recipe? Do I throw in a funny anecdote? Does the anecdote need to somehow tie in to whatever food I’ve made? IT’S A HARD ONE GUYS. I’m just going to write and see what happens. 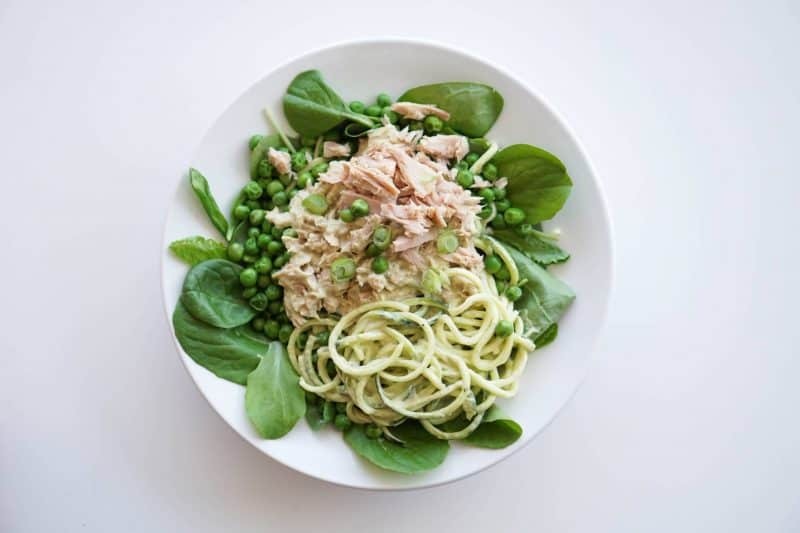 My pantry is actually jam packed with tuna because I can’t do anything in little doses, so when I saw her recipe for these creamy avocado tuna zoodle bowls, I jumped at making them. I also aim to do as little as possible when making food, so the fact that I had 80% of the ingredients already on had sold me on it. It was a really quick recipe to whip up and would have been even easier if I didn’t have to worry about presentation. I trained a couple clients in the morning, then headed home to make this for lunch. I don’t know about anyone else, but I’m really happy that the weather is warm and the farmer’s markets are opening. Even though I always go with high hopes of stuffing my Earth-friendly bag with leafy produce, I’m usually overwhelmed, shove some muffin samples in my mouth, and return home empty-handed. Produce sure is pretty though, huh? I made just a few tweaks to the recipe, the biggest one being not cooking the greens. I can eat a ton of fresh, crispy greens, but the moment I cook them down, I can NOT stand the consistency. Anyone else? To make the avocado sauce, combine the avocado, Dijon mustard, mayo, lemon juice, olive oil, garlic, pepper, salt, and red pepper flakes in a food processor or blender, and blend til creamy. Adjust salt and pepper to taste, if needed. For the bowls, gently press or squeeze as much water out of the spiralized zucchini as possible with a paper towel. Place in a large bowl and toss with half the avocado sauce, coating evenly. In a saucepan on the stove, add the greens with the water and cook, covered, over medium heat until the greens are softened, 2-3 minutes. For the microwave, cook the greens for 20-30 seconds in a microwave-safe dish. In a medium bowl, combine the other half of the avocado sauce with the tuna, mixing well. 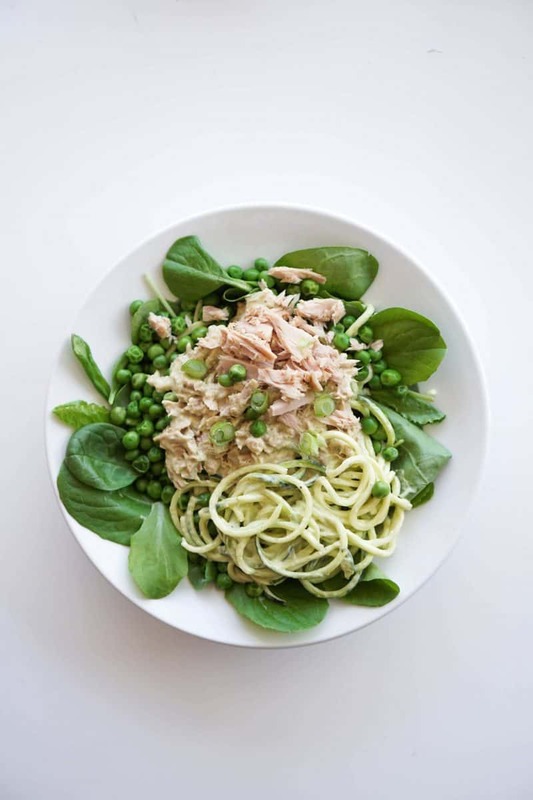 Divide the creamy zoodles evenly among 2-3 serving bowls and scoop 1/4 cup or more of tuna salad on top of each. Add 1/3 cup of steamed greens to each bowl, or place on the side. 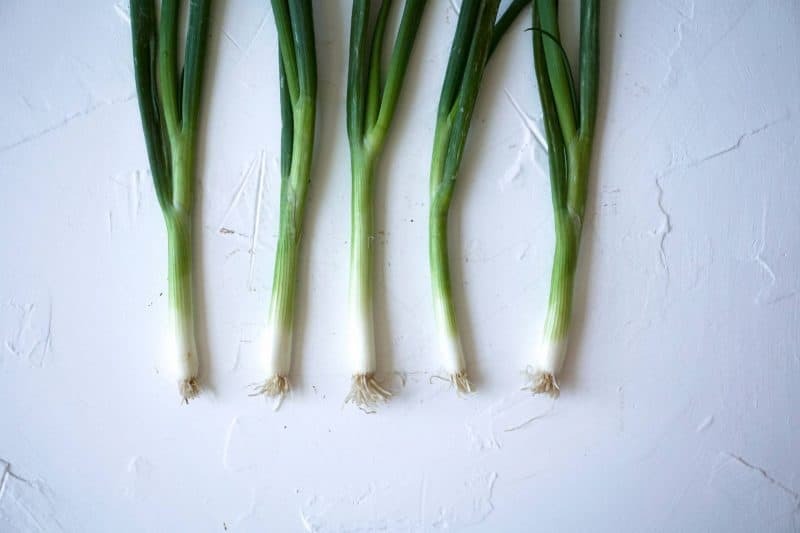 Top each bowl with peas and green onion. Garnish with the chopped bacon and Parmesan, if desired. Season with extra red pepper flakes, salt, and pepper. using real mayo with olive oil or avocado oil gives the best flavor. It also keeps the meal Paleo. Omit the Parmesan topping for a Paleo-friendly option. Need a quick, #glutenfree, #paleo lunch option? 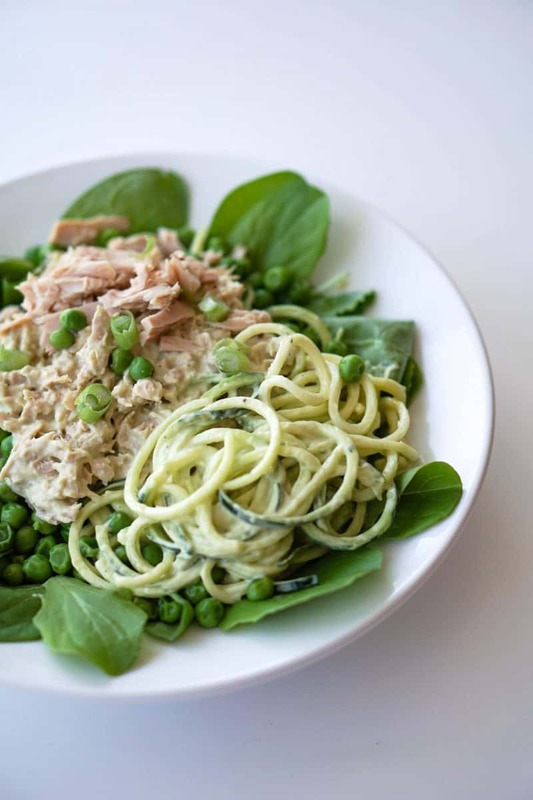 Try these creamy avocado tuna zoodle bowls from @cottercrunch! Thanks for doing this! It means the world!! YES on the raw greens. I HATE the texture of cooked greens, so slimey!